Rent a bike in Tokyo. You can rent and return a bicycle at any station you like!! You can select a plan from below (Tax is not included). *1. At a ticket counter, we only offer 1-day pass with an exclusive IC card. *2. If you purchase 1-day pass with a credit card, please note you can rent a bicycle only once with the issued pass code. Please do not take "Return" procedure for temporary parking as you can not re-rent it. You can return and rent another bicycle within a day when you purchase 1-day pass with a transportation IC card. *3. Please make sure to top up the IC card for sufficient amount before you purchase. You can easily register for membership by PC/Mobile, 24/7. 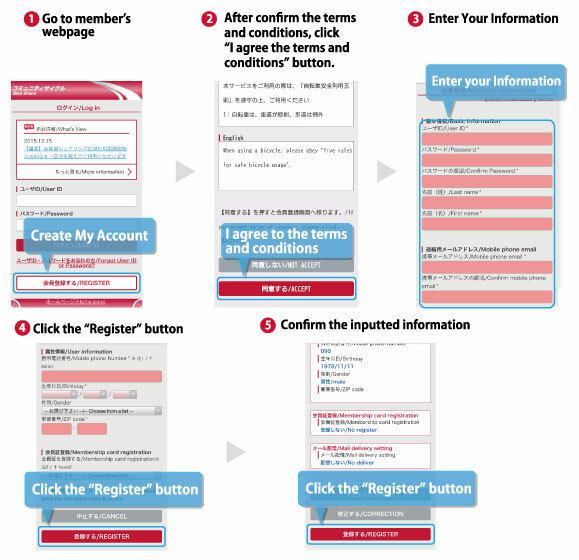 (1) You can register for membership by PC or Mobile phone. (2) Fill out your payment information and the registration process will be finished. 2. Rent with an IC card(Felica). (1) Rent a bicycle with a passcode. (2) Next, press the “START” button and enter the passcode on the device of the bicycle. 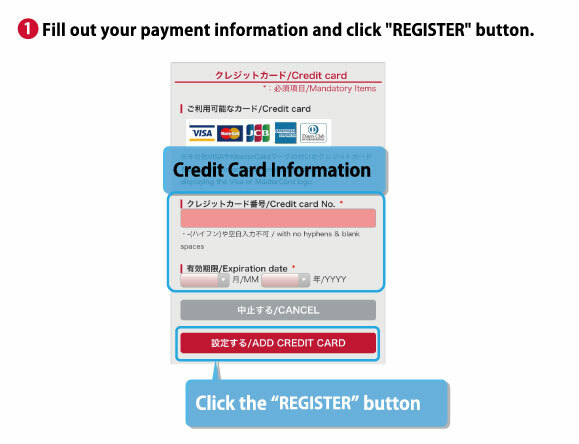 (1) Get the password for IC card registration. 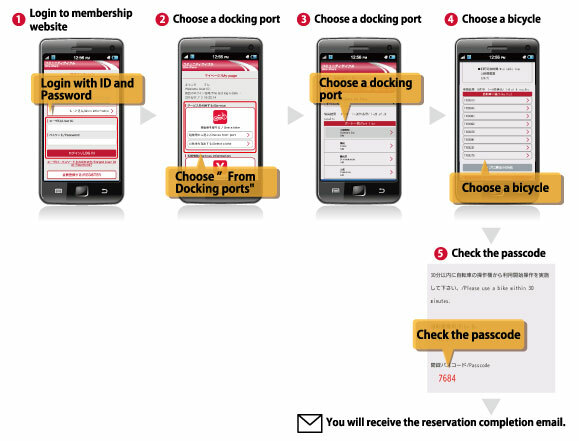 (2) Register your own IC Card. ③Press the ”START” button and then tap your IC card on the IC card reader. (1) Park your bicycle at the designated station, lock the bicycle manually with the rear wheel key. (2) Next, press the “ENTER” button on the device of a bicycle. (1) Park a bicycle, and lock it manually. *Some stations are not available for 24 hours. Please see the station map for details.